I think a great talk is a talk that only that person can give – something created at the intersection of their passions and experience. The best conference presentations are about something the presenter really cares about – either because it’s something they’ve experienced or because they’re deeply interested in what they’re talking about. Try to connect what you’re saying to real-world experiences. If you have anecdotes, use them. If you have places where you tried and failed, use those. Seeing real code is great, but hearing from your personal experience is often better. 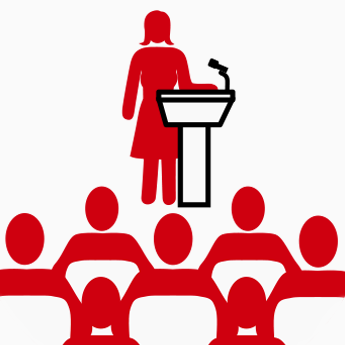 Melissa Kim and Jennifer Kim from the Women Talk Design speaker compendium have put together a practical list of steps that event organizers can take to counter some of the most common reasons women don’t speak at conferences. Check out part 1 and part 2 of their piece. If you’re looking for a detailed, step-by-step guide to preparing any type of talk, take Present! A Techie’s Guide to Public Speaking for a spin. Co-authored by Californians Poornima Vijayashanker and Karen Catlin, this 280-page book is ideal for anyone new to speaking who’d like a hand getting started, but is particularly geared to those in the tech industry. Present! breaks down the process of planning and giving a presentation into bite-sized chunks and comes with a collection of accompanying online videos and other resources. There are suggested activities to go with most sections, many of which involve making video recordings of yourself and watching them back with a critical eye — something that might make you cringe, but that can reap real benefits. Present! goes into detail on topics that shorter books on the subject don’t usually broach, like how to promote a talk and even how eject a heckler – something I hope to never have to do! There are sections on how to be a good panelist or an effective moderator, and another on what it takes to bring your speaking skills to a wide audience through a podcast or webinar. There’s even a whole guide to how to make eye contact with the audience in a natural way. I got to see Poornima and Karen in action while attending the Grace Hopper Celebration of Women in Computing last fall, where they ran a hands-on workshop based on a portion of their book. Their session gave me timely ideas on how to handle larger groups in my own workshops. Once a year, Poornima and Karen teach an 8-week, online, live course on public speaking called The Confident Communicator Course. They cover many of the tips from the book, along with modules on accent reduction, negotiation, and interview skills. The next course begins on February 13 — check it out if you’re ready to invest in becoming a more confident and skilled public speaker in 2017. Catt Small, the Etsy product designer who penned a ten-part series on how to become a public speaker in one year, has packaged up all the posts into an ebook, complete with seven worksheets. It’s available through Amazon for Kindle, and if you buy the PDF/ePub version on Gumroad, there’s a discount coupon available for self-identified marginalized people. Nice. Lara Hogan’s Demystifying Public Speaking, available through A Book Apart, is a gem of a guide for beginners. Full of practical tips, it had me nodding hard in agreement at every piece of reassuring advice. While clearly aiming to inspire new speakers, the book is also realistic, featuring good sections on dealing with tricky Q & A periods and how to handle harassment. There’s tons in Demystifying Public Speaking that I know I’ll refer back to multiple times — both as reminders for myself, and to pass along to my workshop participants. Not sure the book’s right for you? Check out the first chapter and decide for yourself.